Главная » News » What Is ZETSENSOR? ZETSENSOR is a series of digital sensors and control modules, as well as synchronization and data communication modules. With a wide variety of ZETSENSOR devices, you can find an optimal solution for any task in measurements, automation, and control. Digital sensors ZETSENSOR are intended for measuring temperature, pressure, force, relative deformation, vibration, and many other parameters. 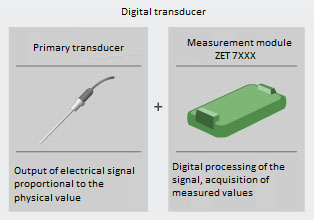 A digital sensor consists of two main components: primary converter and measuring module ZET 7XXX. The primary converter forms an electric signal proportional to the measured value. The measuring module uses this signal to calculate required value. The primary converter can be external and connected to measuring module or it can be embedded, i.e. integrated into the same body with the measuring module. high operational availability – sensors start to work immediately after powering on. The ZETSENSOR control modules form signals to control various equipment and actuators and are used for testing, diagnostics (especially for mounting-less verification and calibration). The portfolio includes analog generators, digital controllers, PID-regulators, dry contact modules and stepper motor control units. Measuring modules are used for feedback. For operation, ZETSENSOR uses RS-485 or CAN buses. MODBUS is used as data protocol. Based on requirements of a specific task, you can select required digital sensors and measuring modules. 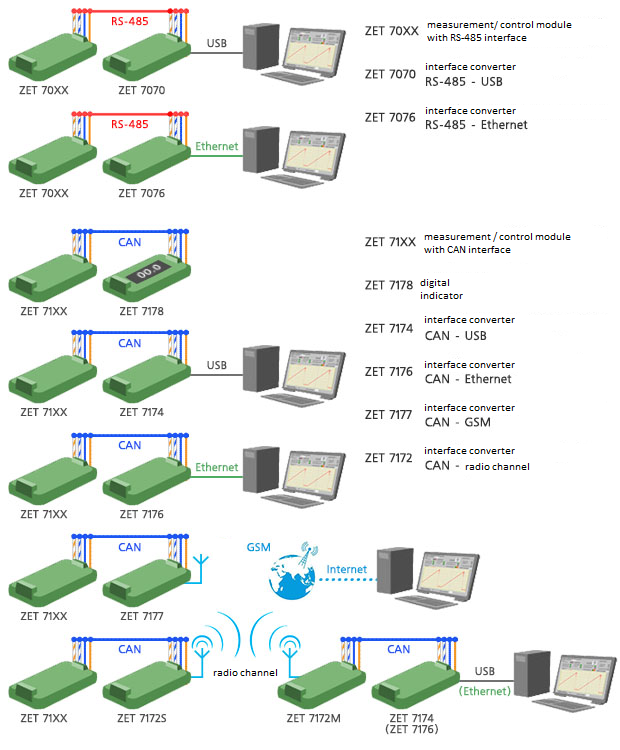 Furthermore, for data communication with PC, interface converters are used. The ZETSENSOR digital sensors can operate in offline mode when data are saved to SD card and upon the experiment completion are copied to PC for processing. if it is necessary to synchronize a distributed system from a reliable timing source, each GPS satellite is equipped with an atomic clock with 1 ns/day tolerance.